Pick up of rental car. Drive to Chichen Itza and visit of the biggest and most visited Mayan site with its famous Kukulcan pyramid, Temple of Warriors, Holy Cenote, Ball Court and Observatory. Afterwards take a refreshing swim in nearby cenote Ik Kil and continue to Merida, state capital of Yucatan. Overnight Hotel El Castellano, Merida. City tour in Merida begins on Zocalo (main plaza) which is surrounded by the major attractions like the oldest cathedral, the Governors Palace and city founders Francisco de Montejos former residence. Afterwards drive to fishing village Celestun located on Gulf of Mexico. Take a boat ride into lagoon, natural habitat of many pink flamingos. Return to Merida. Overnight Hotel El Castellano. Drive into the so called Ruta Puc. 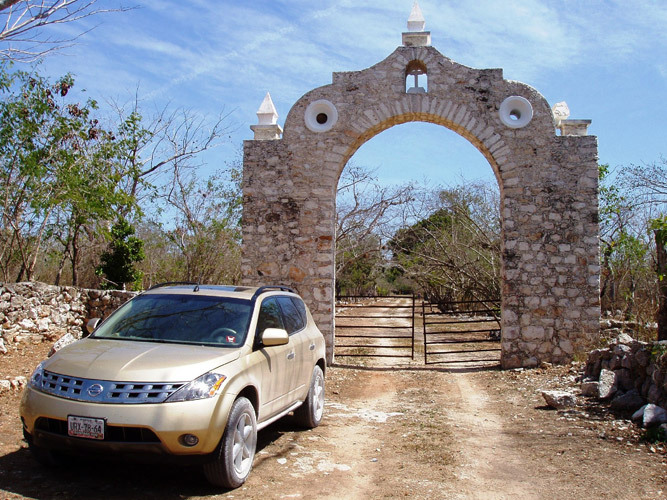 En route visit old henequen hacienda in Yaxcopoil. Visit Uxmal (= three times built in Maya) with its steep pyramid of the Magician and on to Kabah, which is divided by the main road and features a stunning temple of the Masks worshipping rain god Chaac. 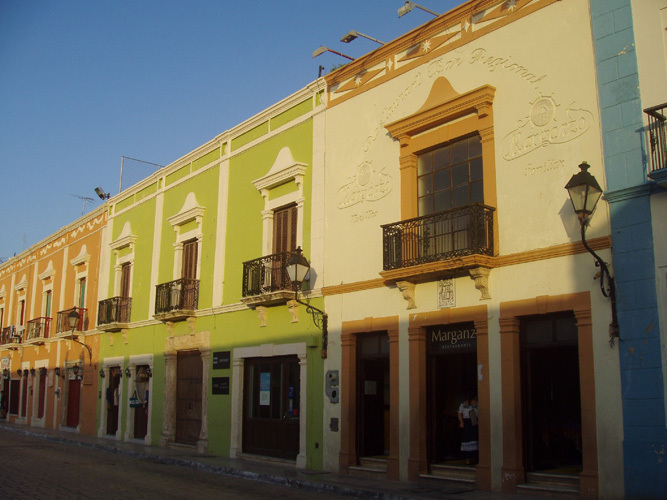 Travelling on country roads, eventually you will reach the colonial city of Campeche in late afternoon. Overnight at Hotel Plaza Campeche, Campeche. Visit of historical city centre that was protected by bulwarks (baluartes) from the notorious pirate attacks. Visit the Maya museum in Baluarte San Miguel and enjoy the recently renovated colonial buildings and churches. Afternoon drive via Gulf of Mexico through the lowlands of Tabasco to Palenque. Overnight at Hotel Ciudad Real Palenque. Early morning visit of mystical site Palenque built in lush emerald rainforest. Look upon the unique and legendary Temple of Inscriptions which holds deep inside the tomb of ruler Pakal. Walk the maze of the Palace with its observatory tower, climb up to the Temple of the Cross. 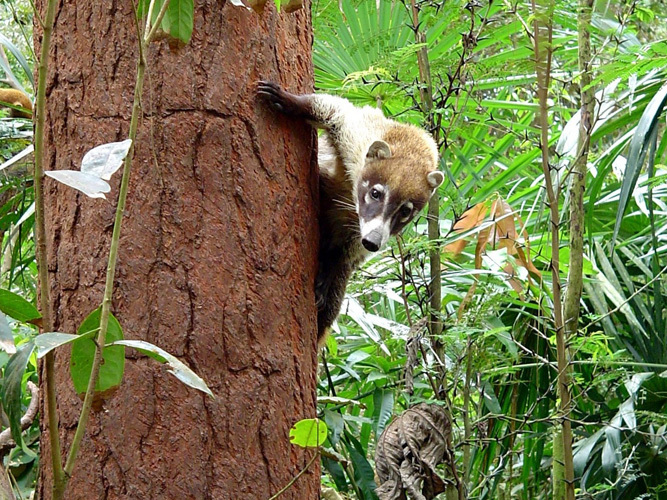 Walk down a jungle path to the interesting regional museum. Afternoon drive on mountain roads to the most beautiful cascades in Mexico, Agua Azul. Take a swim in one of the rock pools. Return to Palenque. Overnight at Hotel Ciudad Real Palenque. 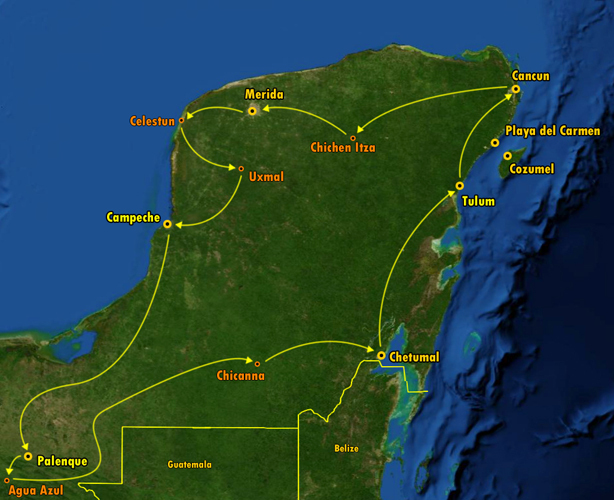 In today’s journey, you will cross the Yucatan peninsula all the way to Chetumal. 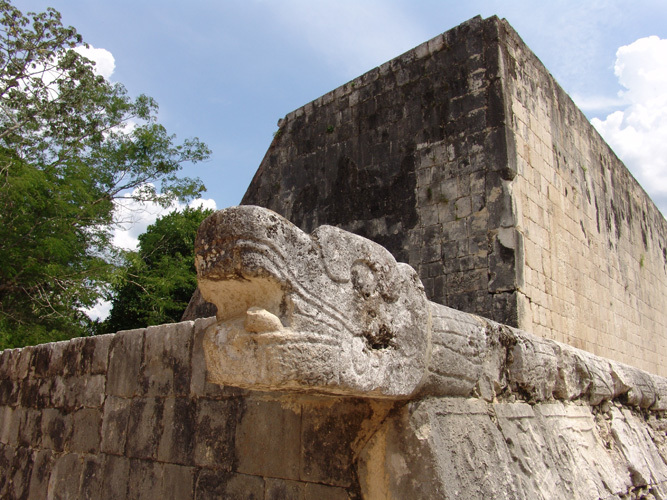 En route we recommend to visit Maya sites Becan, the walled city, and Kohunlich with its giant Sun god masks on main temple. Later afternoon arrival in Quintana Roo‘s state capital Chetumal. Overnight at Hotel Holiday Inn, Chetumal. Visit the modern Maya museum just across your hotel. Stop at the Lagoon of Seven Colours in Bacalar and have a swim in the deep blue cenote Azul. Visit the pirate museum in old Spanish fortress. 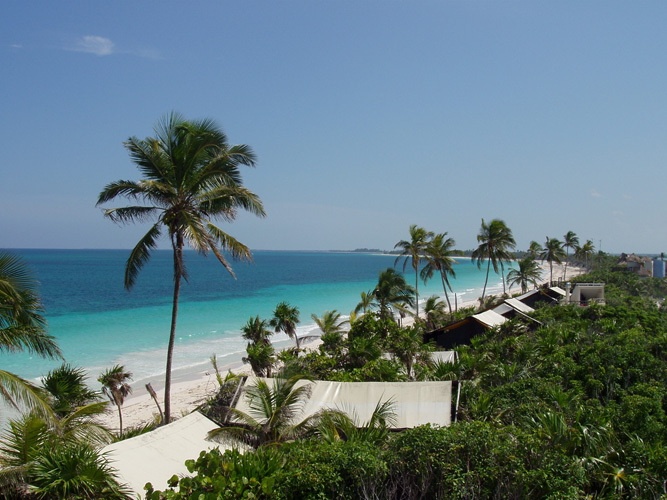 Drive on to Tulum, the ancient Maya port built on cliff top overlooking the Caribbean Sea. Drive to beach hotel in Riviera Maya or Cancun and return rental car. End of services.